People come in to T3 Towers to show us stuff quite often. Half the time, we feel like the people that Apprentice candidates pitch to on the retail and marketing episodes. "You want to launch mint flavoured crisps made of human skin at £15 per bag? No orders from us, thanks." One such pitch came from Thalmic Labs for its Myo gesture-controlled armband. "What the hell is this for? It's just a really over complicated way to control PowerPoint presentations!" we cried. And to be fair, that's what they pitched it as. Well, shows what we know, because now they're using it to allow amputees to control prosthetic arms with their upper arm muscles. Designed and created by Canadian firm Thalmic Labs, the groundbreaking Myo Armband uses the electrical impulses in the muscles of a lost or severed limb to control the prosthetic arm without the need for more traditional voice or tactile commands. In other words, a patient can use their new arm with the power of thought. The tech is the first of its kind and uses electromyography (EMG) sensors that directly sense the natural activity and motion of the muscles in a given limb. Johnny Matheny, who lost his arm in a battle with cancer, has been helping the team develop the tech and currently uses two of the armbands on the remainder of his arm and a proshtetic that's been conntected directly to his skeleton. The data from the Myos are sent direct to a controlling computer which then relays this info to Johnny's new arm. "If Johnny's case shows it is possible to directly turn thoughts into actions, then the future of human-computer interaction can achieve a new reality," says Stephen Lake, Co-founder and CEO of Thalmic Labs. 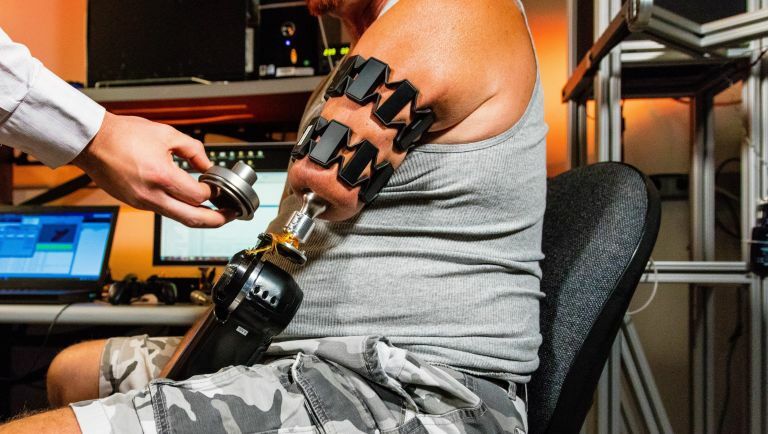 "While each person's arm and mind may be different, this is an incredible example of how scientists, developers and engineers around the world have transformed lives using the Myo armband. That is why we have opened the SDK to third party developers to continue expanding applications users are interested in." The armband itself ways around 95 grams (less than your average wristwatch) so it can sitly snugly on the skin of the user and is small (and comfortable) enough to be concealed beneath most clothing all day long. The Myo is available in the UK now via Amazon, and retails at £179.49. You can also use it for controlling PowerPoint presentations.